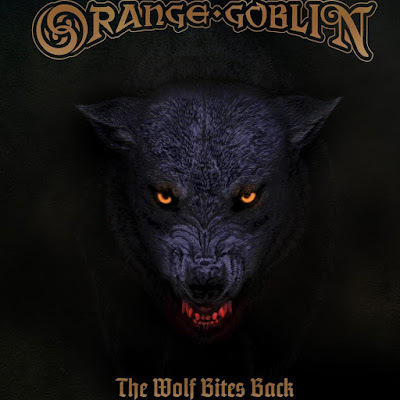 In my opinion, Orange Goblin are one of the most underrated bands from the UK and every album they bring out is very consistent. They're just one of those bands that never slow down and it feels like they've always been around to me. They have a great way of expressing themselves and create some of the best riffs of any rock band around. There are just so many subtleties to the music that make it so enjoyable upon repeat listens. As you can imagine the prospect of a new album is something that would interest me. The Wolf Bites Back, is their ninth album and once again they have maintained that level of quality that spans all of their records. This album has that fire to it and has kept my interest upon various replays. From the first track "Sons of Salem" the album shows more of that brilliant musicianship that we have always seen in Orange Goblin. The pure energy that they produce is amazing, the production on the album really sounds great, with a excellent balance of guitars, bass and drums. As the guitar goes crazy with riffs and solos, the bass and drums keep the songs ticking over with precision playing and keep those brilliant rhythm's in check. The music has a great level of atmosphere and weight to it and it meshes well with the lyrical themes that they bring up on the album. Guitarist, Joe Hoare is an absolute wizard on the six-string. From heavy, roaring riffs to intricate, atmospheric guitar licks. It always sound amazing whenever he comes into it. Along with that, Martyn Millard matches him note of note and phrase for phrase on the bass. All of this is controlled by the beats supplied by Chris Turner, whose drum work is simply spectacular. Keeping the frame work of every song in check. The Wolf Bites Back brings that energy that no one else can duplicate. It's another album that traverses all manner of rock, metal and blues. With pin precision they are able to change their tone, their very mood from track to track. Going from really heavy anthems "Swords of Fire" or "Suicide Division", into more 60's style groove based tunes like "The Stranger" and "Ghost of the Primitives". They've always been able to mange this with finesse and style. Their music is versatile and their song-structures have enough of a basis to keep an audience invested for the longest of times. Also, front-man, Ben Ward has enough personality in his vocal performance that he is able to adapt to whatever the band can put together. Going from very subdued singing to the headbanging, raving mad vocals. You can definitely feel the sheer emotion he puts in. Another winning effort from Orange Goblin. In all honesty they've been in the game long enough now to know how to keep audiences coming back. Nine albums and twenty three years of experience and they're still moving along with grace. The Wolf Bites Back is a great album and if your a fan, well you've already bought it. However if you're just getting into stoner rock then the Orange Goblin catalogue is a damn fine place to start, and it's new arrival fits in well.